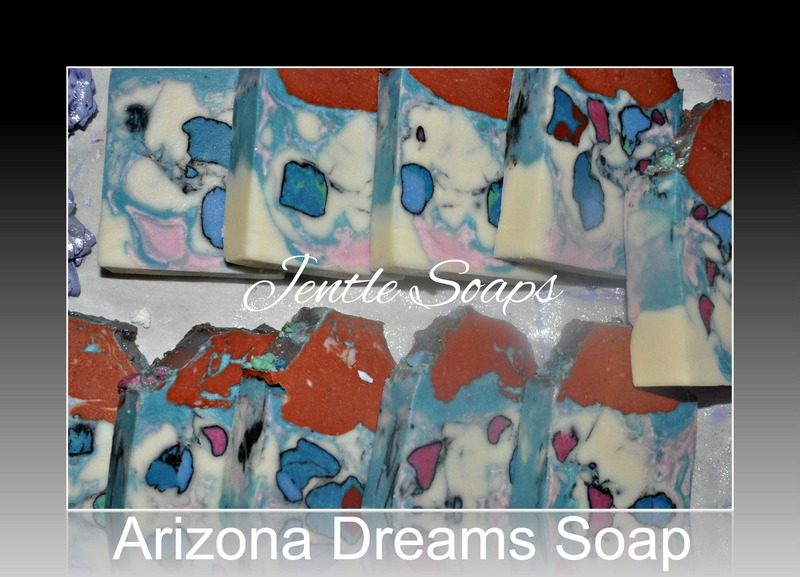 Jentle Soaps handmade beautiful cold process natural soap Arizona Dreams. Most bars are 5 oz or more. 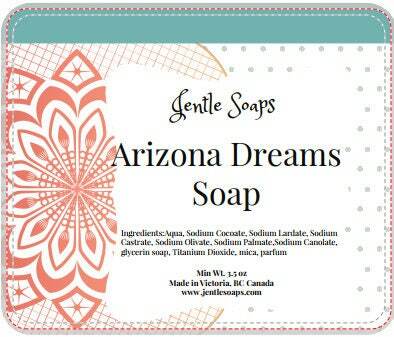 This soap has the look of an Arizona Plateau and is one of my favorite designs. The 'turquoise' stones were hand molded dusted with activated charcoal and embedded within the loaf. I chopped and cut the pink and blue stones that top this high top hand shaped bar. The rich mica lines and dustings on top just add more gilded beauty to this bar. As a child I visited the Grand Canyon, Bryce Canyon and others along the trek from Idaho through Utah, Nevada, New Mexico and Arizona. The trip was spectacular and the colours of the desert we crossed was phenomenal. The thing I loved most was stopping by the road and buying handmade jewelry from the artisans selling their wares. The beautiful colours I loved most from their designs I also used in this bar of soap. I scented this with a wildflower fragrance that reminded me of this journey. For maximum value and to save on shipping order multiple bars from our shop. For maximum value on shipping/packaging costs we recommend you purchase 2 or more bars per order. Every order includes a surprise 'thank you' right from Jen's soaping kitchen.